"Are you planning on hurting someone with that?" "What as in Death by Cookbook?" That's what I got to hear when I unpacked my precious Christmas present. I had desperately wished for it and just picking up the carefully wrapped parcel, I knew what it was at the weight of it. One would probably feel intimidated by the utter size and weight of this thing, but me? I was glowing and beaming from ear to ear! 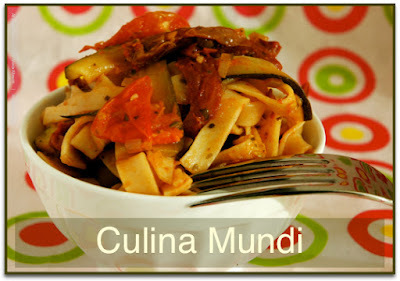 Culina Mundi is a whopper of a cookbook in every way. Over a 1000 pages, 60 World class cooks from 40 countries and over 500 recipes make up this treasure of a cookbook. When Sara announced the theme for the next Weekend Cookbook Challenge I was so excited to finally give Culina Mundi a spin. I flipped through the pages marking all the things that appealed to me. I settled on something Italian and for the first round a bit easy. 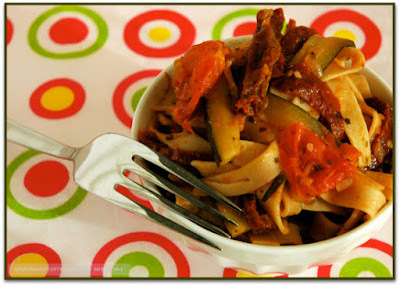 A wonderful flavorful pasta with all my favorite fresh ingredients - zucchini, cherry tomatoes and basil and the added bonus of sun dried tomatoes. The pasta is freshly made, making the entire dish just delicious. I am just a dork and forgot to post it. So, I am hoping that I can misuse the time zones a little and still manage the deadline. 6 sun dried tomatoes - cut in strips. I used some that was marinated with herbs and oil. Prepare the pasta according to instructions. Keep in mind that fresh pasta does not take long to cook so it might be a good idea to leave this till after the topping is prepared. In a large hot pan sauté the garlic without allowing it to get brown. Add the onions, cherry tomatoes, zucchini, sun dried tomatoes, salt and cracked black pepper. Allow this to cook for 1-2 minutes. Tear the basil leaves, coarsely and add to the vegetables. Pour in the white wine and simmer for approx. 2 minutes. Salt and pepper to taste - if required. Now take your cooked pasta and add it to the pan, tossing it lightly until the pasta is nicely covered with the sauce. Let it heat through for a minute. Could a lunch get any easier than that? I know it does sound too easy, but it is amazingly tasty. A great alternative to the usual tomato sauce for the kids. Soeren loves his pasta and this was a huge appetizing delight for him. The extra vegetables add all the healthy nutrients needed and now you can put away the tomato sauce for good. For us adults it is an elegant way to enjoy the simple but oh so big Italian flavors. Tom was soaking up the juices with a piece of bread. 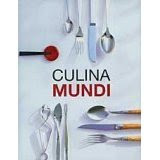 Culina Mundi does seem like a promising cookbook and I really look forward to trying out several of the recipes I have marked. Last call for this month's Monthly Mingle - Sweet Love. February 8, 2007 is the final day to enter all those scrumptious Valentine's desserts, cakes and other sweet stuff. Meeta that looks fabulous =) I am envious of your new book, but I look forward to seeing what else you make from it. Yikes! another book to lust after. Meeta the pasta does look fantastic. I've been spinning some fresh pasta out with my fairly new little pasta roller and having some success. 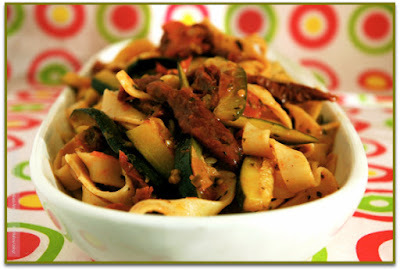 Meeta, the pasta looks great! That isn't another book for me to add to my wanted list is it? I think so!! Meeta you're forcing me to add another cookbook to my wishlist! My credit card is NOT happy with you. Übrigens, auch ich habe Pasta bei der WCC eingereicht :-))). Dürfte auch etwas für deinen Piraten sein. Fresh pasta with full of flavours! I love it! i cant wait to make this! it looks so flavorful. yum-my!!! i love sundried tomatoes! What a healthful and delicious pasta! And 1000 pages...I can't wait to see what else you make. Hi folks, thanks for your comments. The cookbook is fantastic and has great recipes in easy step by step instructions. I know what you all mean ... yet another must have cookbook. But c'mon what would a food bloggers life be without the addiction? I am relatively new to cooking, and I've tried making pasta dishes in the past but they were boring to me with not much flavor. I tried this though, and I LOVE IT! I am so proud that I could make something this good...I am thankful to you and your blog...and by the way I love that you have a verdict section that describes how you feel about the dish. Recipes that stand alone often leave me wondering, even if the ingredients sound great, how good and "worth it" it is.